Newtownhamilton Young Farmers’ Club have had a busy but enjoyable club year during which new friendships where made, along with new memories and not forgetting new experiences in the YFC world. The fun was never ending from the recent calling of BBC London for members to part take in a BBC Oneness clip recording that does be shown between BBC1 programmes involving llama trekking to our annual visit to the Grand Opera House for the club’s Christmas trip. The club also attended local agricultural shows promoting the club and competing in a variety of competitions. With many weeks of hard work and preparation club members took to the stage in Ballymoney to take part in the arts festival competition. An unbelievable effort from all members was shown as they produced a sketch on the ‘Good Ole Days’. A number of Newtownhamilton YFC members have been involved in a Cross-border Youth Diversity Programme during which they had the opportunity to complete their OCN Level 1 Accreditation in Leadership. They took part in various programmes from the ‘Selfie project’ about identity to introducing the other members of the group too jiving. 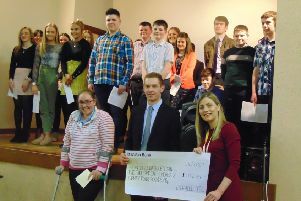 Newtownhamilton YFC are proud of all members who completed their challenging Duke of Edinburgh Award Scheme throughout the year where some members took on the Mourne Mountains and other challenged the Galloway Hills of Scotland. Along with Newtownhamilton YFC winning best video in the club of the year competition at the YFCU AGM conference for the club’s mental health awareness. To bring Newtownhamilton YFC year to a close the club held their annual treasure hunt and barbecue. This gave Newtownhamilton YFC the opportunity to bring the family and friends of the club together and to celebrate the spectacular club year and also presenting awards.